The Shangri La’ Wiffleball Lifetime Achievement Award was first given out in 2002 to honor those who have contributed off the field to SLW. To date, only two have received this prestigious award. 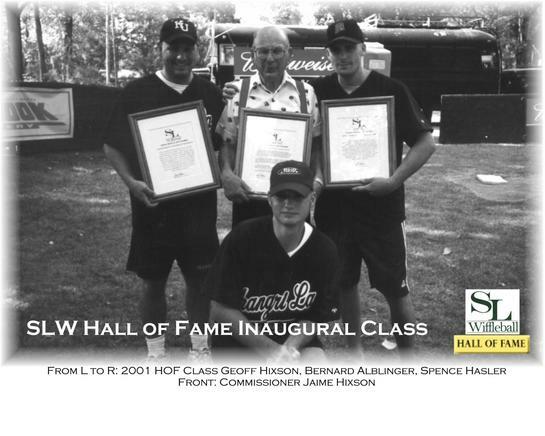 The Shangri La’ Wiffleball Hall of Fame was founded in 2001 to honor those who have contributed both on and off the field to the great game of wiffleball at Shangri La’. The criteria to be elected in to the Hall of Fame is shrouded in secrecy. It is widely believed that selections are made and voted on by a small group of long-standing wifflers. Mysteriously, no members have been inducted since 2006. Geoff HIxson, Bernard Alblinger & Spence Hasler represent the first ever HOF Class at Shangri La'. The Commissioner’s hat in this picture is gay, and promotes binge drinking. I’d like to see the Rookies of the Year as well as a list of the banned former wifflers. I have no information on who was ROY when. Maybe the Alumni Association should have been keeping records. As far as banned wifflers, i’ve got that one in my head.